"On the outskirts of Abu Dhabi, Emirati gold is being spun into a solar-powered city of the future called Masdar. But the most widely copied model for sustainable urban design is the humble, pedestrian-scale 'complete street' approach. [...] The model city of Masdar on the outskirts of Abu Dhabi might be the most ambitious effort mounted anywhere to deliberately foster cleantech innovation. [There is, by contrast...] a different kind of innovation as the foundation of green urban design in the 21st century [...represented by Danish architect Jan Gehl.] In a place like Masdar, you might find some fascinating future-tense technologies, but if you’re looking for the state of the art in complete street design, mixed-use development and multimodal transit -- in urban sustainability, that is -- then Copenhagen’s the place to go. [...] In a sense, Masdar views innovation as a pure function of industrial R&D, a question fundamentally of technology. Jan Gehl’s Copenhagen looks at innovation as a question fundamentally of people, their wants and needs -- a system design challenge, not an engineering problem. Masdar assesses the sustainability challenge as one primarily of energy production, and Copenhagen shows that it is much more a question of energy use. Masdar asks: How do you want to generate power in the future? Copenhagen asks instead: How do you want to live right now? 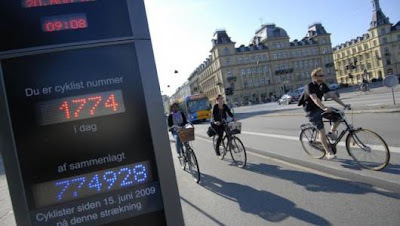 And for now, Copenhagen’s innovation remains the far more significant one." Do you buy this characterization? Perhaps there's a "third way" here? I don't agree with the characterization of the differences between Copenhagen and Masdar City as presented by Mr. Turner. While there is a lot of new technology being developed for use in Masdar City, the overall design will be one of pedestrian cityscapes and ground level social communities. Another aspect of Masdar City is that there will be no roads, or remnants of roads, that constrain the ability to design pedestrian thoroughfares. All in all, design and integration of technology is being used to return the city to the people and not to enslave the people to be automatans serving a technocratic society. Especially in areas in which the geographical location receives a lot of sunlight, using solar power becomes very efficient. The most common way to use solar power at your home is definitely to use solar power to heat your water. Large solar panel cells can store up the energy so that you will have enough of a supply to power your house at night when there is no sun or on days when it is cloudy or rainy and the sun never comes out.